Yet another royal abode of the Wodeyars, the erstwhile maharajas of the state, Bangalore Palace stands tribute to its glorious past of the Maharajas. This beautiful structure was built by Sri Chamaraja Wodeyar in late 19thcentury with Windsor Castle in his mind. This wooden marvel complete with gothic windows and frescos is a nice place to visit. The palace is still in use by the current ceremonial maharaja and we would recommend taking services of a guide to walk you through the palace and explain the decor and past life of the royals. The expansive grounds around the palace are regularly used for holding public events like music concerts and shows. International artists like Iron Maiden and Metallica have performed on these grounds. 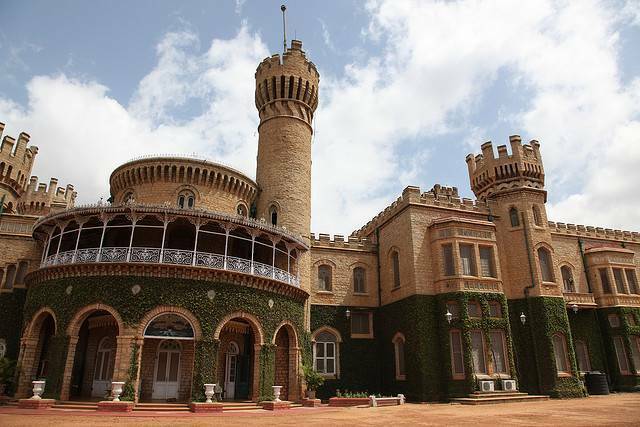 Bangalore Palace has been used as a backdrop for shooting in numerous Bollywood and regional movies. Timings: 10 am – 5.30 pm (Sunday Holiday).